Figure 1 - Default IIS Error Messages are a bit terse. Which is a rather terrible experience for an end user. You'll see similar pages for 404's and full 500 pages. This should be all that you need to get ASP.NET (full framework) to pass through all HTTP responses from your application. As the name of the property suggests this flag can be used to turn off IIS custom error handling on a per request basis. It's easy enough to do this whenever you have access the HttpContext.Response property. once you are sure you've handled the error. Note that in most cases you'll also want to clear the error. If you don't, IIS either throws up a default error page, or in some cases, an empty response as the request leaves the ASP.NET pipeline. Clearing the error takes care of that. However, don't clear the error before you've captured Server.GetLastError() - otherwise you can't access the error information. You can set this TrySkipIisCustomErrors property anytime before the Response gets sent out to IIS - ie. anytime before any output is sent explicitly. If you use Response.TrySkipIisCustomErrors alone you'll find that even with the flag set to true, the response still fires IIS errors rather than the content you return. 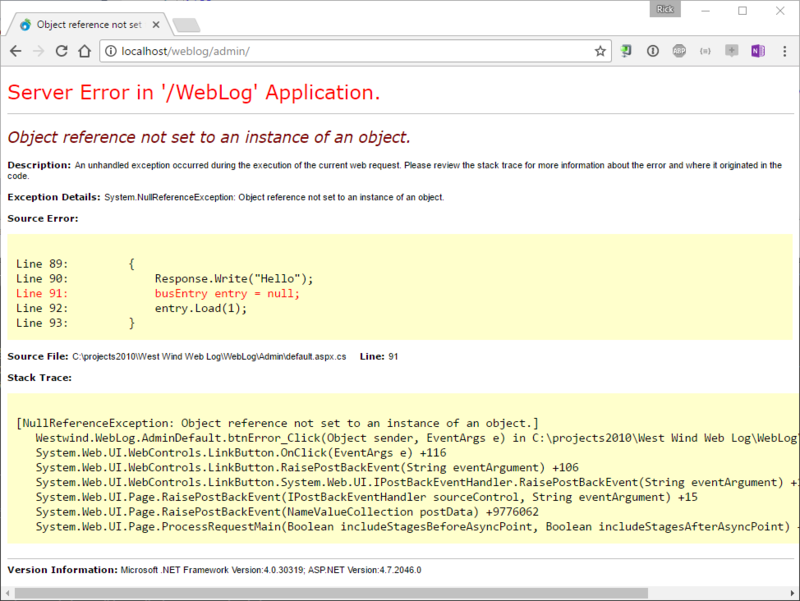 A huge cause for confusion around errors in IIS and ASP.NET is the <customErrors> config element. Because it has so many options and dependent behaviors it's often difficult to figure out exactly what combinations of error handlers are in effect. The CustomError section in web.config lets you configure how errors are processed in an ASP.NET/IIS application. Essentially this setting lets you control what happens if your application doesn't handle an error in the application. RemoteOnly shows detailed error information on localhost, and IIS error messages if remotely connecting. Other choices here are On and Off. Figure 3 - The local IIS error page has a lot more information about the error. As you can see this page has a lot more info on it compared to Figure 1 meant to help a local developer potentially troubleshoot an error which is quite nice. Locally error pages often have a wealth of useful IIS error info on them. Note that this error is specific to IIS Error messages. Figure 4 - The ASP.NET Yellow Screen of Death (YSOD). Lots of developer information available locally. The <customErrors> key is the source of endless confusion in IIS because there are so many different operating modes that affect it, including the switch settings, the IIS execution mode, whether you are local or remote and whether your application handles errors or not. As you can see there are a rather large number of permutations between custom Errors, local or remote access, and how your ASP.NET error handling is set up. The general rule is to run with the RemoteOnly flag which locally shows errors (in ASP.NET) and displays terse error messages on the server. The moral of the story is this: Make sure when you test any error handling UI/output, make sure you test it both on your local test setup as well as on the server. The behavior might be drastically different even with the same exact settings. There are a number of different ways that you can handle errors in ASP.NET applications and where you handle errors depends on the application's context and how you want to approach error handling in general. Most applications should display custom error messages. More importantly - if you're building an API or Service error messages should be returned in the appropriate API error format - a JSON or XML response perhaps. These types of apps usually tend to capture their own errors and should display an error page. Usually you keep the original error code but the error is presented in the application's user interface context, typically with a custom error handler and application safe error page routine. APIS and Services typically handle errors on their own as well and should return a response in the proper response format requested by a client. So if building a JSON backend service for a Web front end you always want to return JSON never an HTML server default message. Ideally your application code should handle errors closely to where the error occurs. In an MVC or API application this typically means via a error ActionFilter, for WebForms this might mean an OnError handler in a base WebForm. What's important here is that if your application returns an HTTP fault code (5xx, 4xx messages), IIS considers the request an error and tries to override your generated output through its custom error processing which includes the logic in customErrors discussed in the previous section. To get around this, you can apply the Response.TryIisSkipCustomErrors setting in the error handling code, just before writing out a custom response with your error response. For all errors that you don't handle as part of your Web application processing, ASP.NET fires on HttpApplication.Error event which is mapped to Application_OnError() in global.asax. This handler captures any Error that occurs during ASP.NET Pipeline processing and hasn't been handled. This can be errors that occur outside of the application handling of MVC/WebForms/Handler requests, as well as errors inside of your Web application code that aren't explicitly handled. I use a fairly boiler plate implementation of Application_OnError that demonstrates some of the tasks I are usually needed in basic error handling code. Notice that there's quite a bit of logic here, mostly to deal with various error codes and error handling scenarios. I use multiple error modes to allow for default error handling (ie. yellow screen of death or YSOD), application error handling (application level error page) or developer error handling which is a custom generated error page that mixes application level error display with most of the info you also see on the YSOD. Not all of this is required or fully generic, but hopefully this gives a good idea of what I want my error handler to do. You can pick and choose the pieces you need from this semi-boilerplate code. Note the use of Response.TrySkipIisCustomErrors, which is used in multiple places right before a specific response is returned to IIS. It's important to understand that although IIS and ASP.NET are closely coupled, ASP.NET doesn't control the entire Request pipeline. Depending on how you configure the pipeline (especially RunallmanagedModulesforAllRequests) IIS still controls the entry point of the application and runs a number of native, non .NET modules to handle requests. If an error occurs in a non-managed module, it supersedes anything you do in your code - in fact your code is unlikely to ever even fire. Web site based authentication errors (for Windows/Basic/Digest that use Windows accounts), request filtering violation, application pool errors, binding errors are some examples that fall into this category. These are relatively rare or specialized scenarios, but nevertheless these are scenarios that happen. Just be aware of them. As you can see ASP.NET applications have a lot of different hook points for capturing error information and forwarding that information. Most applications should rely on Web application specific handlers to capture and handle errors as this is closest to the application to take potentially useful actions based on error types. In most situations this is what you want to use for your ASP.NET applications. Great article - really useful. This helped me finally sort out a 404 that kept returning the IIS default and not my custom one. One small typo, the existingResponse value is PassThrough not Passthrough. Curious: Why set Response.Filter = null; ? @Tony - If you don't set Response.Filter to null, the response may encode, if you apply a filter elsewhere. Since everything is cleared out and you for example applied a Gzip filter somewhere you'll get an encoded response but no header that tell the client that the request is encoded. To be safe you should clear the Response and any filters so you can guarantee you're creating a clean response. Usually not an issue, but Application_Error needs to be very generic to handle all sorts of crazy use cases that might even lie outside of your own application (ie. from the ASP.NET pipeline). Very helpful. But I think customErros is an Asp.net thing and not related to IIS. I'm having a little trouble getting this to work on my project, I've tried everything but it seems like my Application_Error function isn't catching 404 errors. 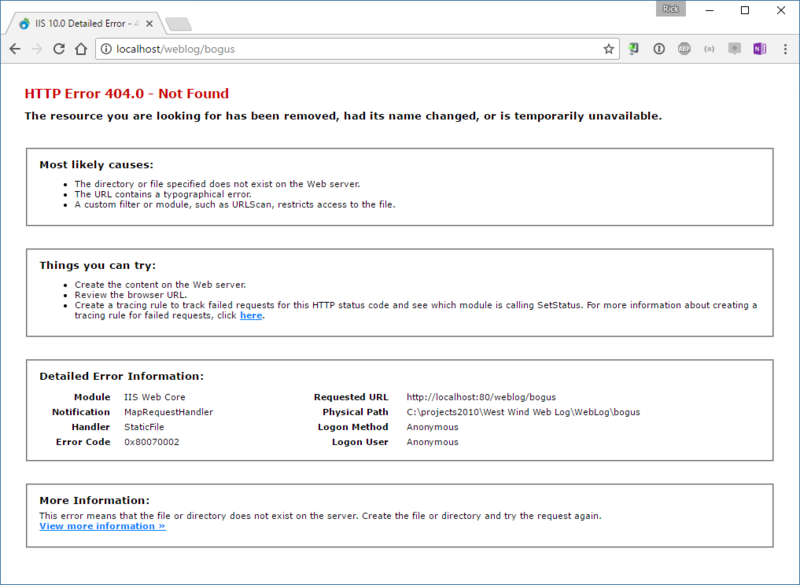 I never hit a breakpoint when I invoke a 404 via my localhost for example when I do: http://localhost:21118/asd , however if it ends with .aspx it does hit a breakpoint. Any idea why this happens? Does it only handle requests that end with .aspx?